From left to right; Attorney Chris Wall, Carol Wooten from District 27, IBC Bank-Port Lavaca Executive Vice President Harry Frankson and Port Lavaca Chamber of Commerce Executive Director Kathy Lee. 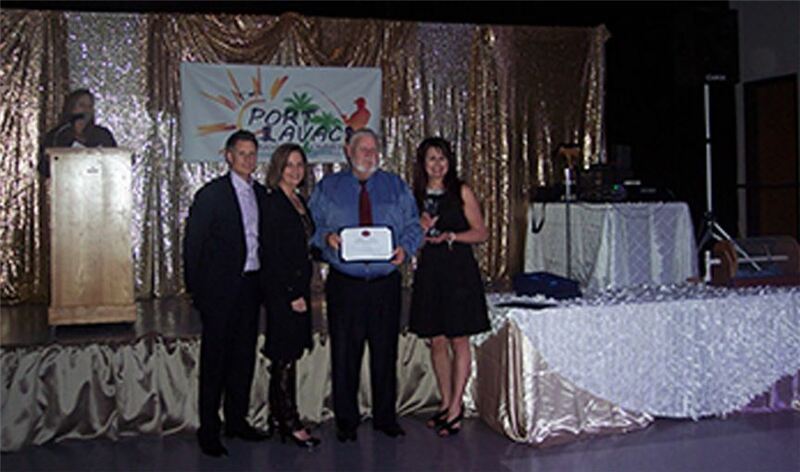 IBC Bank-Port Lavaca Executive Vice President Harry Frankson recently received the Man of the Year Award from Port Lavaca's Chamber of Commerce. Presented at the chamber's annual awards dinner, the Man of the Year Award recognizes Frankson for his longstanding commitment to helping others in the community. Frankson, a Port Lavaca native, has been involved in a wide variety of organizations including, the First United Methodist Church, a life member of the Houston Stock Show and Rodeo, former chairman of the Calhoun County Red Cross and past director and treasurer of the Port Lavaca Calhoun County Chamber of Commerce. Frankson has also served on the board of directors for the Calhoun County Fair for 51 years and held various positions within the organization including past president. In 2016 Frankson received the 50-Year Banker honor from the Texas Bankers Foundation celebrating another aspect of his commitment to Port Lavaca and his dedication to helping his fellow community members.